A tranquil spot, a cup of tea, a book, and something to nibble. Afternoon tea is my favorite time of day. Please join me for Thé de 5 Heures. The theme of today’s tea is The Woman in Black, the 2012 ghost story horror film in which the 17th century English mansion Cotterstock Hall played the role of Eel Marsh House. This tea features the tea and food of my second most memorable afternoon tea at Cotterstock Hall. Usually with afternoon tea I read. But watching a film in which a house I know and, in which I have been a visitor, plays an important role was an equally delightful activity for teatime. Cotterstock Hall does play an important role in the film. In one of the special segments included on the DVD of The Woman in Black that I purchased, director James Watkins comments on the extensive search for a house to exemplify on film Eel Marsh House as originally described in Susan Hill’s novel The Woman in Black, on which the film’s story is based. James Watkins speaks of Cotterstock Hall as an “imposing edifice” that was perfect for the film. In his interview, star Daniel Radcliffe describes Cotterstock Hall’s “grandeur” and relates how the scenery crew transformed a “pristine lawn that looked like something from a magazine cover” into something infested with weeds and overgrown, neglected shrubbery required for the film. In one of the DVD's special segments, you get a glimpse of the crew making this transformation. Only the exterior scenes were shot at Cotterstock Hall. Because of the demands of camera placement and of equipment needed for the special effects, the interior of the house was recreated in a large, elaborate film set. If perhaps the derelict state and the color scene primarily “death black” and “bruise purple” are a tad overdone, it was not until I heard the interviews with production designer Kave Quinn that I was certain the movie was filmed on a film set and not inside Cotterstock Hall. What's Behind the Closed Doors? I particularly noted a scene near the beginning of the film. When Authur Kipps, the young London solicitor played by Daniel Radcliffe, first arrives, he explores the decaying Eel Marsh House. At one point he proceeds down a long corridor trying several doors. This wordless scene of some length reminded me of my single, slightly unsettling experience during my visits to Cotterstock Hall. As I told you previously, in the research that my father-in-law’s cousin Lewis had done on Cotterstock Hall that he bought and restored, no mention of a ghost was found. 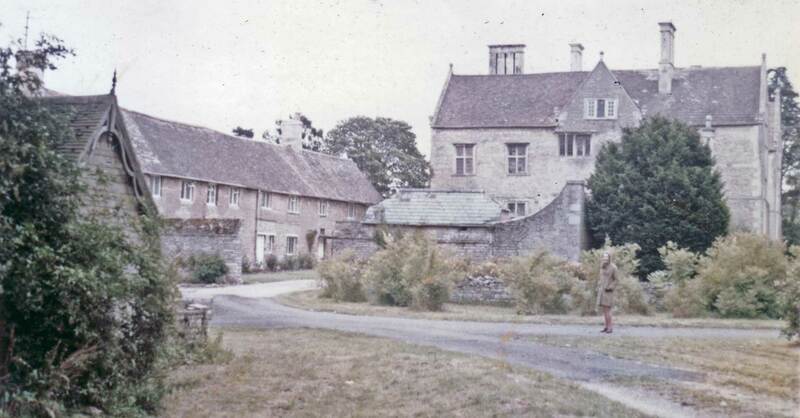 In the photo below there I am on my first visit to Cotterstock Hall in 1970, The Woman in Green. My green trench coat blends me into the Cotterstock Hall garden scenery as much as film’s Woman in Black’s dress and veiled bonnet makes her almost invisible in the inky night. My husband snapped the photo as I set off on a walk to explore the village. Note: this image is reproduced from a badly faded 45-year old color snapshot. Scanning and phototshopping to restore some detail gave the photo a somewhat old painting texture. When I returned some time later, I re-entered Cotterstock Hall by the same door I had exited. But, unfamiliar with the large mansion and unaware that there were two identical grand staircases, one built in 1658 in the original house — and its twin built in the 19th century addition (now removed I understand), I proceeded down the hall and up what I thought was the staircase I had descended when I set off for the walk. Down the corridor I opened a door expecting to find the drawing room. But the room was empty. No furniture. No people. Wrong door, I told myself. I proceeded down the corridor to the next door. I tapped. No response. I opened the door. Another empty and unrestored room. Strange. Definitely strange. Where was Cousin Lewis? Where was his wife Avril and her dogs? I wasn’t sure where I was, but feeling uneasy, I hurriedly retraced my steps down the corridor and down the staircase. I took the ground floor corridor in the opposite direction. There, voilá, was another identical staircase. Up that staircase and down a corridor I found the drawing room, a cheerful fire and my host and hostess. Whew! What Would Cousin Lewis Think? The Woman in Black is a ghost story horror film. And one in which a great deal of research, money and effort went into the details. (Time magazine’s movie reviewer called The Woman in Black “sumptuously scary.”) While following the conventions of the genre —and the well-established traditions of the Hammer production company — the film also deals with the topic of grief. Daniel Radcliffe, and the veteran actors Ciarán Hinds and Janet McTeer give moving portrayals of three different personalities coping with deep personal grief. What would Cousin Lewis and his wife Avril, they who restored Cotterstock Hall, have thought of the film The Woman in Black? Of course, they would have been delighted that this house they bought and lavished such attention (and money) had been chosen for the film. And they would have been pleased by the praising comments that the film’s director and star — and others associated with the productions — heaped on Cotterstock Hall. But what about the story in the film? Surely this refined couple would have preferred that some film version of a work of history or literature be filmed there. If it had to be a ghost story, better that it was Henry James’ The Turn of the Screw that many of us were required to read in literature class. But there are some interesting co-incidences between the restorers of Cotterstock Hall and the film The Woman in Black that might have mitigated their opinion. I remember Avril as a smart, sensible, capable woman. She did not in any way have any of the craziness of grief that the Elisabeth Daily character does. But in the dinner scene in the film, when Elisabeth elegantly attired is presiding over her equally elegant china, silver and crystal-set dinner table, memories returned of Avril in her long black dinner dress presiding over her equally elegantly set dinner table. Like Elisabeth, Avril loved her dogs, but I can assure you while well-loved and well-treated, the Cotterstock Hall dogs did NOT have seats at the dinner table. The dog playing the role of Spider in TWIB is one whose breed I cannot identify. Spider is Sam Daily’s dog that Sam insists that Arthur take with him the night Arthur intends to spend working though the night on the papers in Eel Marsh House. Viewers keep up with the threat of The Woman in Black by the dog’s growls and barks. While watching the dog in the film, I kept looking back to the photo taken when Cousin Lewis brought along one of the dogs on our visit to Fotheringhay Church and thinking that the dog appeared to be the same breed as Spider in the film. Though the dog in TWIB is definitely larger than the Cotterstock Hall dogs were. More co-incidences. The Woman in Black, as the screenplay is written, takes place in the early years of the 20th century. Manohla Dargis reviewing TWIB for The New York Times says that because of the Rolls Royce that Ciarán Hind’s character Sam Daily drives, we can place the story between 1907 and 1914. In the film, when Arthur compliments Sam on his new vehicle, Sam says proudly “First one in the county.” This establishes that Sam has purchased the Rolls Royce not long after its first availability in 1907. If the story does indeed take place in 1907, in that year Cousin Lewis was 4 years old — exactly the age of Arthur Kipps' son Joseph played so well in the film by Misha Hadley, four-years-old at the time of filming. And Cousin Lewis’ father, as Arthur Kipps in TWIB, was a London solicitor. Cousin Lewis would surely have recognized the toys and clothing worn by the children in the film as those from his own childhood. He might have identified with the child Joseph Kipps in the film and have been more approving of the story than otherwise. Equally, Cousin Lewis might have driven the production crew crazy during the filming pointing out to them minor details not exactly the way they were when he was a child. Scones with Blackcurrant Jam. Such wonderful memories I have of the delicious taste of Avril’s warm from the Cotterstock Hall kitchen scones eaten with her homemade blackcurrant jam she had made from blackcurrants grown in the Cotterstock Hall garden. Soundtrack for The Woman in Black composed by Marco Beltrami. The most obvious music choice for A Woman in Black Tea would be the film’s soundtrack. Interestingly the first selection is titled Tea for Three Plus One. The composer Marco Beltrami has a long career creating the background music for Hollywood horror films. Along the way he has picked up an Emmy nomination and two Oscar nominations. Marco Beltrami’s Wikipedia page says, “Beltrami's signature style is based around highly percussive texture. He often employs both traditional percussive instruments like bass drums, as well as violins and brass instruments, forming layers of hits and stabs.” All the selections of music that give the film such a haunting and eerie Victorian horror ambiance would not make the best music for an afternoon teatime. But they certainly set the mood for the film and often were the means for letting the viewer know that the unseen Woman in Black was lurking. The Woman in Black, the 2012 ghost story horror film directed by James Watkins and starring Harry Potter star Daniel Radcliffe with excellent performances from Ciarán HInds and Janet McTeer.